A seemingly wild rumor of Apple planning to launch new EarPods headphones with integrated heart rate and blood pressure sensors has been making the rounds today after the claim was posted on anonymous information sharing platform Secret (via Reddit). Redesigned remote too. Extra mic for better noise canceling. While a number of major tech stories have in fact broken on Secret, the anonymous nature of the platform makes it all but impossible to separate legitimate claims from fiction without corroborating information from other sources. As a result, it's easy to dismiss this EarPods rumor from someone claiming to have recently been let go from Apple. But what makes the rumor a bit more interesting is that it has roots in Apple's research as documented in patent applications dating back years. Whether the Secret rumor is a fake inspired by those patent filings or if there actually is something to it is unknown, but it's worth taking another look at what Apple has proposed. 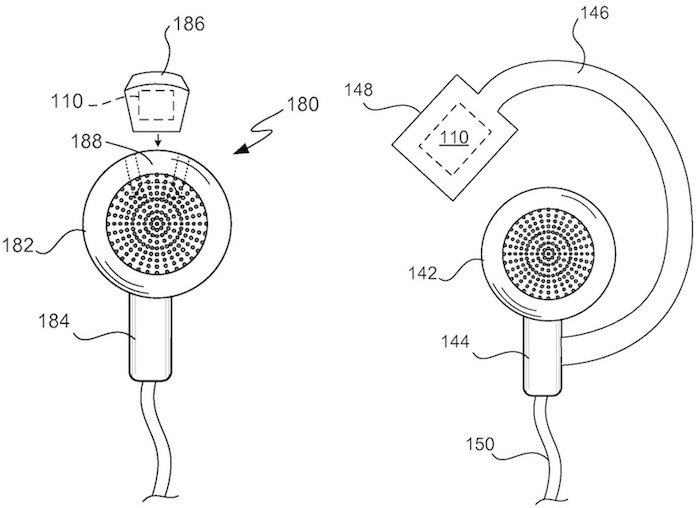 In one patent application filed in March 2007 and claiming a priority date of September 2006, Apple proposes using sensors integrated into various accessories or even devices themselves to collect physiological data. The present invention can include systems and methods for integrating sensors for tracking a user's performance metrics into electronic devices and accessories therefor. In one embodiment of the present invention, the electronic devices can include portable media devices similar to iPods sold by Apple Inc. of Cupertino, Calif. or cellular telephones similar to iPhones designed by Apple Inc.
Alternatively, Apple proposes using sensors embedded in an iPod or iPhone "sling" armband to monitor such data. 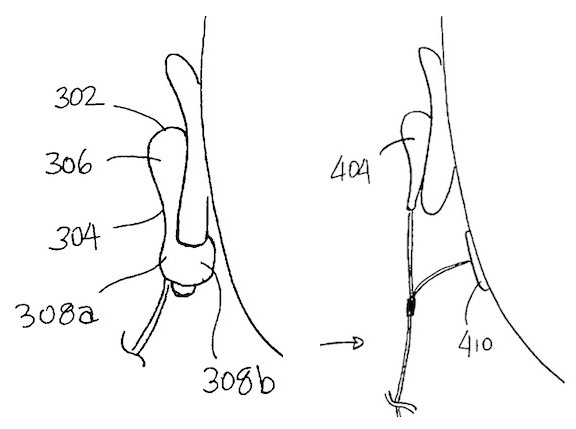 Notably, two of the inventors listed on the patent filing are longtime accessories head Jesse Dorogusker, who moved to Square in 2012, and "father of the iPod" Tony Fadell, who left Apple in 2008 before starting Nest. A second filing, which was granted as a patent this February, more directly addresses headphone-based physiological monitoring, although the application is also quite old, having been filed in August 2008 with an October 2007 priority date. Biometrics have been rumored to be a significant part of iOS 8, with a new "Healthbook" app for tracking various types of health-related information being a key addition to Apple's mobile operating system. With Apple also rumored to be deploying biometric sensors in an upcoming iWatch, it's clear that the company has been looking at ways of collecting health-related data for many years and the effort may finally be coming together. Headphones that tell you you're fat. Nobody with any common sense uses Apple's headphones now. Not being fooled into spending $399 for a pair of in ear headphones and instead using the pair that came free with your iPhone sounds like common sense to me. And they aren't actually THAT bad. I find them comfortable and think they sound reasonable. Now THAT'S a workout accessory!! If true, those headphones better be comfortable. Something the current EarPods are not. "Yes. No one charges their phone when doing any sort of fitness anyways so it won't make a difference for most." But many people listen to their music whilst charging their device e.g. when studying in the library - I have done this countless amount of times. If such a thing happens, it'd be a stupid move by Apple. However Apple would not make such a move as they may just be able to do this through the headphone jack by embedding such technologies into the port. Nobody with any common sense uses Apple's headphones now, so Apple will either have to make this an open implementation standard (ha! ), or this data isn't worth having to put up with crappy sound. The worst case scenario would be another ****** "made for iPhone" licensing debacle driving up prices and down quality like the controller or charging cable situations. I'm a producer and I take sound quality pretty seriously. The EarPods are pretty good for daily commute use. The bass reflex is fairly strong. And the mids are about as good as earpieces get. Nowhere near a good set of speakers, but great daily use phones. Now the older ones from 2001-2012. They sucked big time. I couldn't listen to memos on those bits of rubbish. Nonsense, for several medical reasons. Not least of which is you can't measure blood pressure in your ear. If true, those headphones better be comfortable. Also, if headphones do in fact end up using the lightning port, then, that just means the replacement headphones will be expensive. Yeah, because something hasn't been possible in the past, that means it's not possible, period? You cannot measure blood pressure from the ear. Period. In order to measure blood pressure extravascularly, one needs to physical occlude an artery which, by the way, humans do not have one available to occlude in the external ear canal. Technology certain may evolve quickly, producing things we never thought were possible, but the human body does not. So, sorry to be the bearer of bad news.